Assemble a distinguished look with the Furla™ Babylon Xl Envelope. Envelope clutch made of leather. Brand name logo hardware featured at front. Floral printed scarf accent at the front. Top-zipper closure. Lined interior features three credit card slots. Imported. This item may ship with an attached security tag. Merchandise returned without the original security tag attached or a damaged tag may not qualify for a refund. Measurements: Bottom Width: 11 in Depth: 1⁄4 in Height: 7 1⁄4 in Handle Length: 6 3⁄4 in Handle Drop: 1 3⁄4 in Weight: 8 oz This product may have a manufacturer's warranty. Please visit the manufacturer's website or contact us at warranty@support.zappos.com for full manufacturer warranty details. Please note, the hardware color and interior lining may differ from the color shown in the photo. 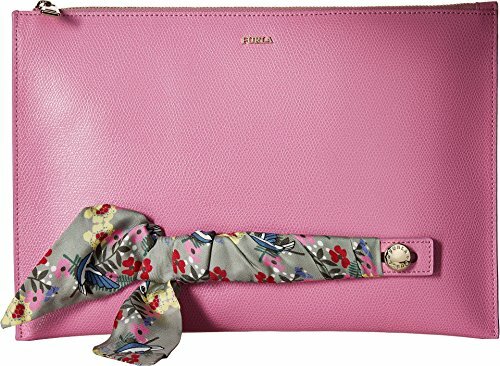 If you have any questions about this product by Furla, contact us by completing and submitting the form below. If you are looking for a specif part number, please include it with your message.